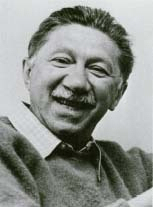 American psychologist Abraham Maslow broke new ground in psychology by putting emphasis on the best people instead of broken people. Instead of studying cars in a junk yard, he moved to a new car showroom. Prior to his time, psychology was limited to the spinal reflex theory of Sechenov (1863) and Pavlov (1927), the behaviorism of Watson (1913) and Skinner (1948). While contemporary psychology at the time was wallowing in the mud of human misery, Maslow studied the values of the best men and women in history. He asked what made people like Albert Einstein and Eleanor Roosevelt exemplary? 1 Self Actualization -Fulfillment Needs (full potential) This is the rare level where people have need of purpose, personal growth and realization of their potentials. People on this level are fully functional, acting purely on their own volition and have a healthy personality. 2 Ego -Self Esteem Needs (self respect, personal worth, autonomy) On this level, people act from their ego needs. They value the options of others, in order to believe in themselves. It is a matter of self-respect through respect from others. 3 Social - Love and Belongingness Needs (love, friendship, comradeship) On this level, people need to feel loved. Here loving one's self has not been fully discovered. Some families are tightly bond. If this need is very strong, there can be a rush to fulfill this need resulting in less than ideal partner selection. 4 Security - Safety Needs (security; protection from harm) Here we might include living in a safe area away from threats. This level is more likely to be found in children as they have a greater need to feel safe. Those who worry about small things, such as drinking out of plastic glasses have strong security needs. 5 Body -Physiological Needs (air, food, sleep, stimulation, activity) People on this level tend to be sick or in emergency type situations. They have biological needs for physical equilibrium (homeostasis). People with lack of shelter, clothing, food focus on these needs. People often neglect some of these basic needs in normal life when they eat junk food, go without sleep, don't exercise, or do not simulate their minds. In life we have to sort out what is important and make determination of our and others best course of action. We can chose plan A or plan B. How do we determined what to do? We need a reference Maslow called B Values. We compare this reference to the situation at hand. For instance is something reflecting unity, perfection, richness and honesty? As we ascend Maslow's Hierarchy of Needs, more B Values are considered. Self-actualized people are most likely to reflect on them. D Needs or deficiency needs are needs we notice by their absence. A D Need of air is quickly noticed. We do not have to think about needing air, we just need it. Transcend their cultural conditioning and become world citizens. Find their vocation and right mate. Know that life is precious. Be good and joyous in all kinds of situations. Learn from their inner nature. See that basic needs are satisfied. Refresh their consciousness; appreciate beauty and other good things in life. Understand that controls are good, and complete abandon is bad. Be given practice in making choices, later allowing choices in their religious beliefs. Self actualized people were reality and problem centered, and could distinguished what was fake and dishonest from what genuine. They realized that the means and ends are different, and thus the end did not always justify the means. They enjoyed being by themselves, and having deeper relationships with a few people instead of more shallow relations with many people. These people tended to be autonomous, relatively free from physical and social needs. They had a sense of what was true beyond their culture, and were highly resistant to enculturalization and thus enjoyed being themselves and did not worried about fitting in. Their humor was never a threat, and they often were the brunt of their own jokes. They tended to be spontaneous and simple in their nonconformity while also having a certain humility and respect for others. They had freshness, a creative spirit and were original in the thinking. These people had experiences of being moved by forces larger than themselves to enjoin peak experiences. In reality, these people were not perfect. Indeed they suffered from what ordinary people do. Their anxiety and guilt was about real things, and their moments of coldness were brief and often somewhat justified. Others saw them as natural, and flowing with life. They appeared to rise above distinctions such as the spiritual and physical and were indifferent to what others perceived as masculine or feminine. The Hierarchy of Needs: A Theory of Human Motivation (1943). The term "Self Actualization" was not created by Maslow, but was coined by Kurt Goldstein in 1940 and later widely used by Carl Rogers. Maslow died from a heart attack on June 8, 1970. In the comparison table earlier presented, the 7th Chakra, the Crown Chakra does not have any correspondence in Maslow's Hierarchy. In strongly spiritual and religious people, this is a very important need. It is the need to do God's work. 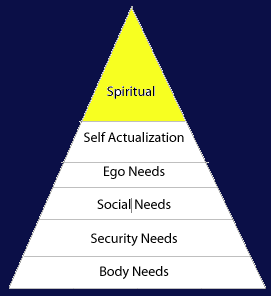 Perhaps we could add a 6th level beyond Self Actualization and call it "Spiritual." In the chart below we compare Maslow's Hierarchy of Needs with the Seven Chakras from Eastern Psychology and tradition and with the three ego of states of Transactional Analysis (TA) created by Eric Berne. The Parent, Adult and Child ego states are useful in understanding communications between two people. A cross Transactions in Transactional-Analysis (TA) occur when, for example, a person in their Parent Ego state communicates with a person in their Child Ego state. If instead, the two people are in their Adult Ego state, their feeling towards each other are not filled with disruptive emotions. The idea of cross transactions can be extended to the seven Chakra states of one of the Maslow hierarchal states. For example, if a person is in their Crown Chakra, and taking with a person in their Throat Chakra, it usually does not go very well. Consider that the brain is made up of billions of small neurons. Each neuron or group of neurons has a small job to do. If that was all there was to it, the neurons would defend themselves, have their own agendas, and might wall of themselves from the rest of the brain. For the neurons to cooperate with each other, they must have use some type of organization. It could be like the Internet, with no one group in charge. Or it could be built like a company, with different levels of management. A better analogy might be government, with not only a hierarchy, but different branches, and a balance of power at the top. The organization usually has a police department that can keep everyone from hurting each other managers who can fire employees that do not perform well. The president or CEO, must have a vision, a direction for the organization. With this type of reasoning, the brain must have some top brain cells that make sure the person is generally doing what is good. The top brain cells reference a belief system. This belief system could range from hedonistic to a true believer. These brain cells might communicate with a higher power through their imagination. But here imagination is not taken as making something up, but a channel to a higher spirit or spirits. When a person loses their internal mental government, they can become mentally ill. Their brain can be spilt with different brain cells at cross purpose with other brain cells. We do not know how many hierarchies might be in a brain, and if there is a pattern found in most people. Some interesting research could be done in this area. I like the Four Agreements and thought about making them part of the comparison table, but it does not seem to work. These ideas seem to help us go up the Hierarchy, but are not part of the Hierarchy itself. Self actualization requires honesty, loving one's self, wanting the truth, and doing our best. As we climb, we do not make as many assumptions or take things as personally. I want to modify the first agreement, "Be impeccable with your word." When we reach higher levels yes we value truth. But Ruiz misses the idea that truth by itself is not enough. Truth by itself can be hurtful and lead to poor consequences. Just truth by itself is not enough. Truth needs purpose and direction to be effective and good. Truth coupled with wisdom and love is much better than truth by itself. 1. In a loving way, be impeccable with your word.